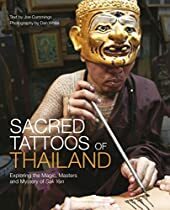 Sacred Tattoos of Thailand: Explore the Magic, Masters and Mystery of Sak Yan is the first illustrated book in English to trace the history and origins of the Tai hand-inked tattoo tradition. While Thailand remains the centre of the cultural form’s conservation and development, similar traditions exist today in Cambodia, Laos and parts of Vietnam, China and Burma. The product of 18 months of field research and photography, Sacred Tattoos of Thailand brings the world of this fascinating and commonly misrepresented tradition to light. Rather than sensationalize sak yan and popularize the misconception that the tradition is the stuff of gangsters and bad boys, Sacred Tattoos of Thailand sheds light on the tradition’s spiritual roots and how it combines into a single belief system elements of Buddhism, Brahmanism and animism, all of which are underpinned by a strict moral and ethical code that is passed from master to disciple. While masters range from monks to laymen, the “sak yan people” featured in the book come from all walks of life, from New York rock drummer Ming Roth, Singaporean deejay Chris X’Ho and Thai actress Jan Yousagoon, to nightclub bouncers, wandering monks and an officer from the Department of Special Investigations. Joe Cummings expert text traces the development of the tradition in Thailand, Cambodia and Laos. While sak yan is in decline in neighboring countries, the narrative shows how Thailand remains the safe harbor of this vibrant cultural form which otherwise would be at risk of dying out. Beyond bringing the life stories of the various ajarns and their predecessors to light, the author explores the magic and symbolism of the various tattoo traditions, including primary research into the little known Lanna script from Northern Thailand. Visually, Dan White’s reportage-style photography takes readers into the salas of the sak yan ajarns, shedding light on their daily lives, the preparations and rituals that give the tattoos their power, and the deep relationships that are formed between master and disciple. Rather than opting for posed “artistic” portraits the photographer has taken great effort to show the people and places featured in the book in their everyday lives, making them the story.